When I was little, I bounced around between voice lessons, gymnastics, piano, theater, guitar lessons, volleyball, pingpong, dance. You name it, I’ve probably tried it and my parents just totally rolled with it. Because of this I stayed, at the most, mediocre at every one of those things. I can play the guitar but if the song involves more than 6 chords, forget about it. I also stopped going to voice lessons before I got up to Whitney Houston level (actually I stopped after 3 sessions but that doesn’t stop me from belting out I Will Always Love You). A diploma looks better than a list of classes. Anyone who looks at your resume will be much more impressed seeing a degree than hearing you say “I took 45 credits at CCBC.” Although it says a lot that you aced those classes, a diploma just screams, “HIRE ME BECAUSE I CAN ACCOMPLISH THINGS.” If you later earn a 4-year degree, it further shows that you followed the pattern. You’re more likely to finish your bachelor’s degree in 4 years. This blog highlights research claiming 71% of transfer students who come in with a degree/certificate completes their bachelor’s degree in 4 years. That’s YUGE! Wouldn’t you rather take the path that gives you a better chance of succeeding? Money, money, money. Sooooo many transfer scholarships, particularly in Maryland, are awarded only to those who have earned an associate’s degree. GET DAT MONEY, HONEY! Lastly, life sometimes throws curveballs… Even if something rudely stops you from getting that 4-year degree, you’ll already have a credential for employment. I learned in business that part of a disaster recovery plan is to have secured backups of your data which may be your biggest asset. If your biggest accomplishment thus far is attending college, BACK! IT! UP! Ctrl+S. Frame that degree. Back up that precious money-making asset! 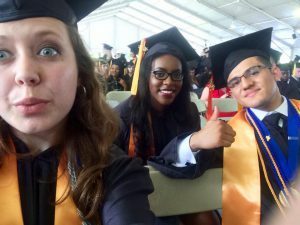 College completion isn’t always a topic of discussion among students, but as someone who has reaped the rewards of it, I can tell you that there are great benefits to it beyond those listed above. 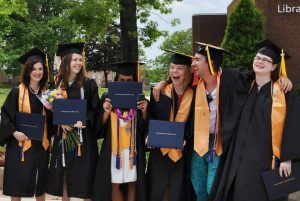 A degree from CCBC is a great accomplishment! More than that, it’s a challenge, a commitment, and a high-return investment. If I could go back, I’d totally go to more voice lessons so I can show off at karaoke Fridays or even pursue my dream of being a famous singer. (Don’t tell anyone that). I would tell younger Jonna that there’s greater value in finishing what was started over just bouncing around. Many thanks to Toni Aho and Courtney Topolski for helping me with this post. I treasure you both and will forever be grateful to CCBC for giving me people like you. I’m so privileged to know you.